A group of strangers journey by helicopter to a remote tropical island, home to a mysterious hermit with a taste for luxury. The island certainly seems serene and peaceful -- but when one of the strangers turns up dead, the promise of a quiet vacation becomes a desperate struggle to stay alive. Who among them has a hidden motive for murder? The answers seem to lie in the deadly secrets they keep. Can the answers be unravelled before it's too late? Available now in hardcover and paperback! 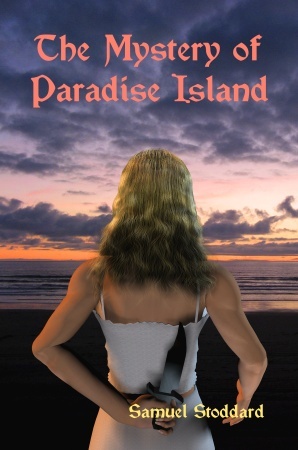 This is the official web site for The Mystery of Paradise Island , a mystery thriller novel written by Samuel Stoddard. Hardcover and paperback editions of the novel are on sale now! About the Book - A short spoiler-free description of what the book is like. Front and Back Covers - View images of the front and back covers of the book. Working Back Cover Blurb - Before the back cover text was finalized, the back cover was designed with an amusing placeholder blurb. Here, you can view this earlier version of the back cover. The Origin of the Story - The Mystery of Paradise Island has unusual history. Here is a brief account of the story's origin and evolution into a full-fledged novel. Acknowledgements - No book is an island unto its author. Deleted Scene - This short scene was cut from the final revision of the book. Contains medium-sized spoilers. RinkChat Play - This is a condensed version of the story that was performed in RinkChat with pictures of the characters and locations. MAJOR SPOILERS ABOUND. What's Different About the RinkChat Play - For those who have read the book but not the RinkChat play, you may want to know what's different in the play before you decide to read it. What's Different About the Novel - For those who have read the RinkChat play but not the book, you may want to know what's different in the book before you decide to read it. The Mystery of Paradise Island is a RinkWorks production. We invite you to visit our other features. The Mystery of Paradise Island and all content on this web site is Copyright © 2008 by Samuel Stoddard. All rights reserved. No material in the book or on this site may be copied or redistributed without prior written consent.